It is difficult, the press release assures us, to summarise Shōhei Imamura's legendary 1967 film, A Man Vanishes (Ningen jōhatsu, or The Unexplained Disappearance of a Human Being), the first picture produced by Japan's countercultural Art Theatre Guild (ATG). Is it a documentary that turns into a fiction? A narrative film from beginning to end? A record of improvisation populated with actors or non-actors (and in what proportion)? Is it the investigation into a true disappearance, or a work merely inspired by actual events? Even at the conclusion of its final movement, A Man Vanishes mirrors its subject in deflecting inquiries into the precise nature of its own being. A middle-class salaryman has gone missing – possibly of his own accord – and a film crew has set out to assemble a record of the man and the events surrounding his disappearance. As the crew meticulously builds a cachet of interviews with the man's family and lovers, their subject and his motivations become progressively more elusive – until the impossibility of the endeavour seems to transform the very film itself. Long unavailable anywhere on home video, Imamura's A Man Vanishes remains a unique and crucial entry in a provocative filmmaker's body of work, daring as it does to ask the big questions: what is reality, and what is a man? 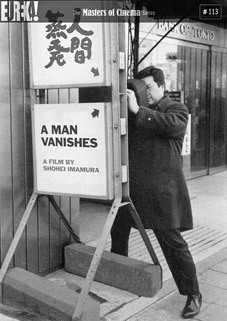 Directed by the great Japanese director Shōhei Imamura, A Man Vanishes is one of the most requested, influential, and acclaimed pseudo-documentaries ever made. Taken from a new high-definition restoration which premiered at the Cannes Film Festival in 2011, the Masters of Cinema Series will release the film for the first time on DVD in the UK, in an impressive new restoration, on 24th October 2011 at the RRP of £20.42. More extras to be announced closer to the release date.